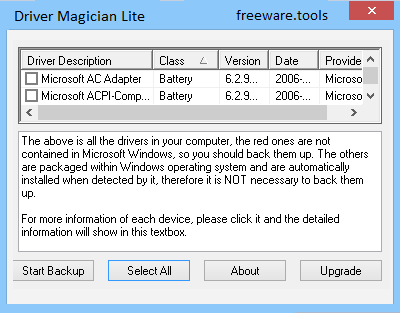 Driver Magician Lite is freeware, it identifies all the hardware in the system, extracts their associated drivers from the hard disk and backs them up to a location of your choice. Then when you format and reinstall/upgrade your operating system, you can restore all the "saved" drivers just as if you had the original driver diskettes in your hands. What's more, Driver Magician Lite has a built-in database of the latest drivers with the ability to go to the Internet to receive the driver updates. It saves lots of time to find the correct drivers and mature drivers will obviously increase the performance of hardware. If there are unknown devices in your PC. Driver Magician Lite is an application which allows you to perform a backup on your system's drivers. It's the ideal type of tool you need in case you lose the discs with your original drivers. Getting them from the Internet can become a time-consuming process. That's why Driver Magician Lite proposes a simpler solution. Once you initiate the program with the plain and simple interface, a list of all the available drivers is automatically displayed. So, you can check out the driver description, class, version, date and provider. The drivers which are highlighted in red are not related to Microsoft. You can use a button to select all drivers and then initiate the backup creating process. If you choose a particular driver, you can view the device ID, device information file and driver files number of a device, as well as a short description, on the bottom part of the screen. The program takes up a very low amount of system CPU and memory, and quickly performs a backup without causing the user any problems. However, there is no help file available and the program has very limited features. The drivers are not even displayed in an alphabetical order and there is no search function. Nevertheless, Driver Magician Lite is a straightforward application.